London based software developer ReelNRG is a new name on the online casino scene, having only arrived in 2016, meaning that this is a company with a lot of work to do if it’s going to battle it out with the smorgasbord of established names that already exist in the market. It’s not an easy task, but it isn’t impossible either, and a few names (although a small percentage of those that have tried) have succeeded in this mission, does ReelNRG look capable of doing the same? One thing that has always made the difference for a new developer is having experience behind it and ReelNRG definitely has that. Calvin Kent, one of the founders of the company, has IGT and bwin.party in his CV, while co-founder Amit Majumdar boasts nearly 20 years in the industry. The two have now gone out on their own, with an ambition to create top quality casino games that bring a little taste of something different to the market. Whether ReelNRG will live up to its potential remains to be seen, as there are not, to this point, many games to judge from, and even less real money titles. The early focus of the company has been on social gaming, although it is clear that the long-term intention is for real money versions of their games to also be made available. There are around ten titles so far, and without a platform of their own, the aim is, one can safely assume, for ReelNRG titles to be added to the collections of online casinos who offer a range of developers. The games released so far are unique and innovative, from the first release, Snow Wild, to Shanghai Respin, Spinderella’s Riches, and more. ReelNRG slots will make a solid addition to any line-up of games, so expect to be seeing them more and more going forward. 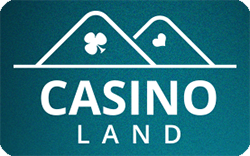 Casinoland has a good number of slots and casino games including live casino from different providers. Games from NetEnt, NYX, Quickspin and Play N' Go. 100% first deposit up to £400.